The 81 series direct operated regulators are designed for high-pressure service and for large leads like factories, office buildings, restaurants, etc. Their outlet pressure ranges from 5 to 20 psig. High pressure regulators usually reduce tank pressure to an intermediate pressure for use by another regulator. They are also used for Final stage service on particular application (pounds to pounds). 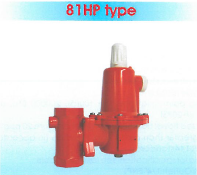 Type 81HP regulator is an adjustable high pressure regulator with a wide range of outlet pressures. It can be equipped with a limited relief valve. Type 81 regulators are equipped with ¼” FNPT side outlet which is normally plugged and provides an opening for an outlet pressure gauge. Type 81 regulators can be equipped with Viton trim. The 94 series direct operated regulators are designed for high-pressure service and can be used on either on vapor or liquid applications. Their outlet pressure ranges from 3 to 100 psig. High pressure regulators usually reduce tank pressure to an intermediate pressure for use by another regulator. They are also used for Final stage service on particular application, as high pressure burners as well as other medium sized commercial industrial applications. Type 942Hp regulator is an adjustable high pressure regulator with a wide range of outlet pressures. It is not equipped with a limited relief valve. Type 9482Hp regulator is an adjustable high pressure regulator with a wide range of outlet pressures. It is equipped with a limited relief valve. Both types are equipped with a ¼” FNPT side outlet which is normally plugged and provides an opening for an outlet pressure gauge. The 49 series operated regulators are designed for high-pressure service and can be used on either on vapor or liquid applications. Their outlet pressure ranges from 3 to 135 psig. High pressure regulators usually reduce tank pressure to an intermediate pressure for use by another regulator. Note: Type 49 regulators do not have internal relief valves, so these regulators cannot be installed in fixed piping serving 0.5 appliance systems. 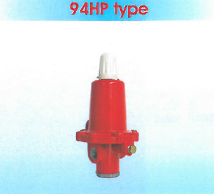 Type 492Hp regulator is an adjustable high pressure regulator with hand wheel adjustment. Type 493Hp regulator is an adjustable high pressure regulator with wrench adjustment and 3 spring ranges from 3 to 100 psig. 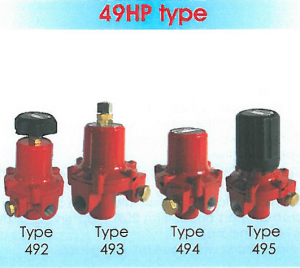 Type 494Hp regulator is a fixed high pressure regulator with no field adjustment. It is very compact. Type 495Hp regulator is an adjustable high pressure regulator with a dial cap adjustment. This cap eliminates the need for a gauge on portable applications. All types are equipped with a ¼” FNPT side outlet which is normally plugged and provides an opening for an outlet pressure gauge. Regulator specifications: see following table. The second stage regulator is a regulator reducing the pressure coming from a first stage regulator directly to the inlet pressure of the user appliance or to a medium pressure value in case of installations with pressure governors. 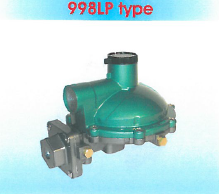 Therefore 988 LP Type regulators are designed for Type A installations. They have to be used outdoors in correct mounting position with vent-hole turned downwards. In the standard version these regulators are delivered with vent-hole in line with the inlet fitting. The double stage regulator or so called twin stage is a regulator consisting of two regulation levels, which regulates the inlet pressure, coming from the withdrawal cylinder or tank directly to the inlet pressure of the user appliance. 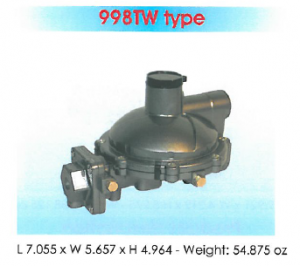 988 TW Type regulators are designed for Type B of installations. They are to be used outdoors in correct mounting positions with vent-hole turned downwards. In the standard version, 988 TW Type regulators are delivered with vent-hole turned in line with to the outlet fitting.